The Independent Deepwater Petroleum Terminal and Petronas' Refinery and Petrochemical Integrated Development (RAPID) have the potential to turn Pengerang, Johor, into Asia's very own Rotterdam Port. Dialog Group Bhd executive chairman Ngau Boon Keat said Pengerang with all its natural attributes such as sheltered harbour and water depth of 24 meters can emulate Rotterdam Port as an oil and petrochemical hub. Rotterdam Port, with an independent storage capacity of 28 million cubic meters catering to 400 million population base is the world's largest oil refinery and petrochemical hub. 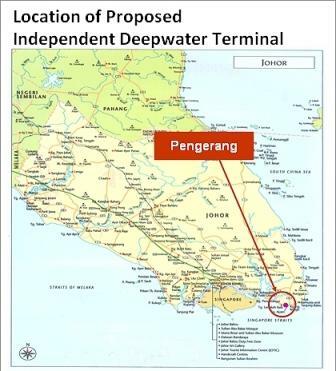 "In 15 to 20 years, Pengerang can be Asia's very own Port of Rotterdam, to be among the world's largest oil and petrochemical hub," he said during a briefing on the progress on the construction of the Independent Deepwater Terminal here yesterday. The RM60 billion RAPID project by Petronas in Pengerang is due to be completed in 2016. The RM5 bilion Pengerang Independent Deepwater Petroleum Terminal is a joint-venture project by Dialog, Vopak and the Johor state government, scheduled to be fully completed in 2017, with five milion cubic meters of storage capacity. According to Ngau, the Jurong Industrial Park in Singapore, which has been the region's refinery and petrochemical hub for some time, had a water depth of 18 meters. The 24-meter jetty facility at the Pengerang Independent Deepwater Petroleum Terminal, he said, would enable the handling of Very Large Crude Carriers and Ultra Large Crude Carriers. The first phase of RM1.9 bilion is scheduled to be completed by December 2013 for first oil commissioning in January 2014 to meet customer's deadline, he said. Ngau said the terminal has signed up long-term customers, including international oil traders and multinational oil companies. "The joint venture is continuing to market its terminal and future expansion to more customers," he said, adding that the terminal will be able to handle storage, blending and distribution of crude oil and petroleum products.